I don't know if it's coincidence or just luck, but Honda always seems to know what I like: simple, strong, and easy on the eye. The Honda CBR textile jacket is all of these. It is even sold in my colors: black and white. The cut is a traditional taper, which complements any rider aesthetically, and is adjustable in the arms and waist, which complements any rider comfortably. A high collar will prevent your neck from being exposed to the wind or rain from getting under your collar. Abrasion-resistant AR-600 makes up the outer shell, and CE approved armor is conveniently located in the shoulders and elbows. Textile jackets are not known for their lack of airflow, but if you really need to cool down, there are strategically placed zipper-controlled vents. 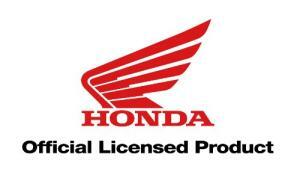 This is an official Honda licensed product and bears the Honda name on the chest and the wing emblem on the arm. These are the only symbols displayed on this jacket. The visual appeal comes from the stitching, cut, and simplicity. This jacket is available in black, gray, and red. Despite the fact that riders love this jacket, it is being shuffled off for newer models. This is good for you because you can find it on sale. So get shopping; this jacket will not disappoint.